I’ve given this a lot of thought over the years, and it seems to me that sci-fi is the film genre with the most originality left in it. That’s not to say that there’s no originality left in other genres, just that sci-fi seems to afford the most imagination, leading to more original material. Perhaps it’s because sci-fi itself is such a wide open concept. A given film’s plot could be merely a society based sometime in the future; or one whose society is based in the past, but whose technology is different than our own; or one with aliens; or one with weird creatures who can read minds; the list, and thusly the possibilities are endless. 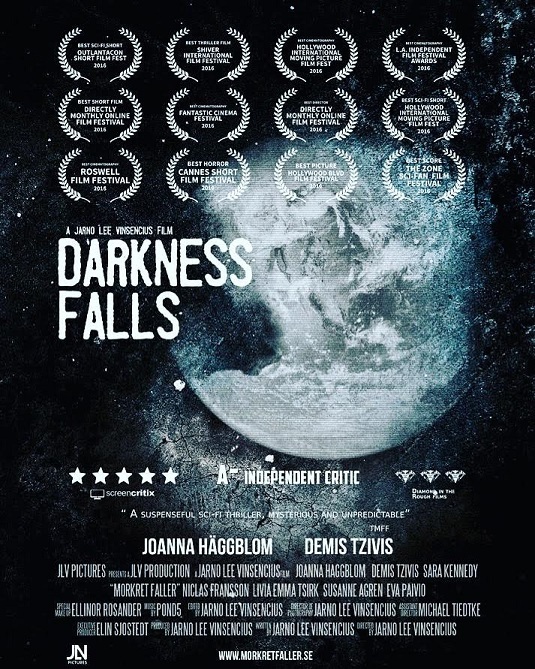 The short film Darkness Falls by filmmaker Jarno Lee Vinsencius is listed on imdb as a thriller, and I do agree with that category, but the overwhelmingly obvious category it should be in is sci-fi, although I can’t tell you why without spoiling it for you. What I can tell you is that the mysteries in this little film aren’t solved fully by the credits, but that’s not necessarily a bad thing. The film is about Melissa. After waking up alone in the woods two weeks ago she’s had trouble sleeping, nosebleeds, and amnesia. She meets with a man named David who swears he’ll answer all of her questions, but all in all he only makes them worse. David’s theories into what’s happened seem more farfetched than most Stephen King novels, leaving Melissa wondering who to trust and, more importantly, who to believe. Although I’ve only seen one other film from filmmaker Jarno Lee Vinsencius, it seems that he has a piety for darkness. The first film of his I’d seen, Svarta Madam, or The Madam in Black, is based on an old Swedish legend that is similar to our “Bloody Mary”. Most scenes were shot at night and include fog, and the ones that don’t were shot on an overcast day, giving the film that eerie feeling. Darkness Falls is similar in that regard. Much of the film was shot on overcast days, and the indoor scenes all have an underlying darkness that really sets the tone. It’s almost as if Jarno uses the darkness itself as a character in these two films, taking advantage of movement in the shadows just off camera to signify that the darkness is there and must be acknowledged, if not embraced. While this attraction to and use of darkness in film is not new, (think of Tim Burton’s films for example), it seems every filmmaker who utilizes it has his or her own unique style. Based on the two films of his I’ve seen, I’d say that Jarno’s style is to take advantage of the mysteries that lie just out of sight in the darkness, and to use them to broaden the mysteries and overall tone contained in the films themselves. Darkness Falls is a 15 minute thrill ride with more twists and turns than a roller coaster. I could see it easily making the transition from short to feature, although I’m not sure if Jarno would do that or not. It’s a mysterious and wonderful little film that you should definitely see if given the chance.